Appologies to any youth workers out there (particularly if you've got a participation remit) – I seem to be asking quite a lot of you this evening – but, after weeks of preparation I can happily announce the launch of the 'Youth Work and Social Networking' survey as part of a wider research project I'm working on for The National Youth Agency. To quote from the post I've just written over on the project blog. How are youth workers using online social networking tools themselves and in a professional context? 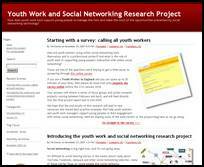 And what is the role of youth work in supporting young people's interaction with online social networking? Those are two of the questions we're hoping to get a little closer to answering through this online survey. If you are a Youth Worker in England and you can spare up to 25 minutes of your time, then please do head over and complete the survey online before the 21st January 2008. Your answers will inform a series of focus groups and action research projects running between February and April, and will feed directly into the final project report due in mid 2008. I'm collaborating on the research project with Pete Cranston and just through our initial conversations and early background reading, a wealth of fascinating sub-questions about how youth work interacts with online social networking have been thrown up. So I'm hopefuly that through the survey we'll soon start to see the outlines of some answers emerging – although I'm sure as many questions will be raised as answered! We're targetting the survey at 22 specific local authorities, but other youth work professionals from England are very much welcome and encouraged to complete the survey also.